In 2014 a new, excellent translation of Diderot’s Le Neveu de Rameau—by two Oxford academics, Kate Tunstall and Caroline Warman—was published as Denis Diderot’s ‘Rameau’s Nephew’: A Multi-Media Edition. Through Open Book Publishers, it is available in digital and printed editions and free-to-read in Open Access. This philosophical dialogue, set in a popular Parisian chess café, is the best-known of Diderot’s works. A battle of wits between the narrator and the eponymous nephew of a famous composer, Le Neveu de Rameau is quoted four times in Hegel’s Phenomenologie (1807) and, partly because of this, is still read widely today. The dialogue’s title on the autograph ms. was Seconde Satire: it is stuffed with sometimes scurrilous references to the later 18th-century equivalents of bankers (fermiers généraux), less than talented starlets, denizens of grub street, paparazzi. Towards the end of Rameau’s Nephew, moreover, Diderot discusses music both in general and in the form of contemporary opera-comique. Reading the work requires considerable contextual knowledge, or patience with footnotes. Editing it required solving the problem of convenient reader access to a bank of supplementary but necessary material. The new translation is accompanied by images and notes illustrating the allusions and, most importantly, by recordings giving life to the musical references. This matters, since many of these references are presently obscure, though they are important in understanding the text – it is not by accident that Hegel seized on the section of the dialogue most preoccupied with music for his quotations. 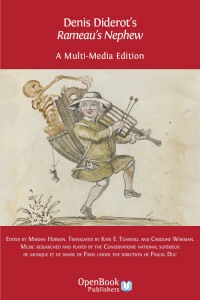 Illustrating the music posed problems of copyright: the solution suggested by the musicologist Michel Noiray was to have excerpts chosen by an eminent specialist on late baroque music, Pascal Duc, of Les Arts Florissants, and then played under his baton by students of the Conservatoire national de musique de Paris. One of these also wrote commentaries on the excerpts. To these materials—all available online—we have now added a transcription of the work’s very first appearance on the stage of ‘world literature’: in a translation by Goethe (1805). For it was only in 1823 that a reliable French version was published, in reaction to a ‘backtranslation’ claiming to be the original. Our edition of Denis Diderot’s ‘Rameau’s Nephew’ is thus truly multi-media, interdisciplinary, and multi-lingual. Denis Diderot’s ‘Rameau’s Nephew’: A Multi-Media Edition is edited by Marian Hobson and translated by Kate Tunstall and Caroline Warman. It won the British Society of Eighteenth-Century Studies’ prize for digital publication in 2015. Marian Hobson is Professor Emerita of French at Queen Mary University of London. This entry was posted in Author Posts and tagged Caroline Warman, Diderot, Goethe, Interdisciplinarity, Kate Tunstall, Les Arts Florissants, Marian Hobson, Open Access, Pascal Duc, Rameau's Nephew, Translation. Bookmark the permalink.